This speedy workhorse printer is popular for 11"x17" printing. It includes 32MB RAM, a JetDirect card for connecting to a network, plus an extra 500-sheet feeder. Limited stock -- call for pricing & availability 866-352-7108. 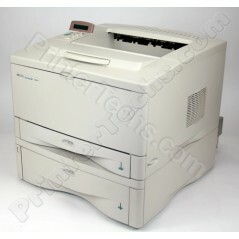 The LaserJet 5100TN is a sturdy workhouse in print shops and engineering firms around the world. It is capable of 11"x17" printing. The printer speed is 21 ppm. Includes 32 MB RAM and an HP JetDirect card for connecting to a network. An optional 500-sheet lower cassette is added so the input sheet capacity increases to 850 sheets.